I’ve answered a lot of mail in the past few weeks and one theme that threads through many of the emails is that the number of state employees is increasing rapidly, that they are paid way too much, and that their benefits are vastly greater than private sector workers. The conclusion is that we should be able to solve our entire budget problem with small adjustments in compensation. Last year I supported a budget solution that would have required larger healthcare contributions from employees than we achieved in the final negotiations, but the general premise of this comclusion isn’t right. Let’s start with the numbers. I’ve uploaded a spreadsheet with numbers from the Legislative Evaluation and Accountability Program (LEAP) committee. You can recreate them from their website if you wish, but it’s a lot of work. We excluded higher education and K-12 from this evaluation. That’s another post, and not what people think about when they think about general government workers. In general, you’d think that the number of employees we need would increase as the population increases – there’s more work to do. 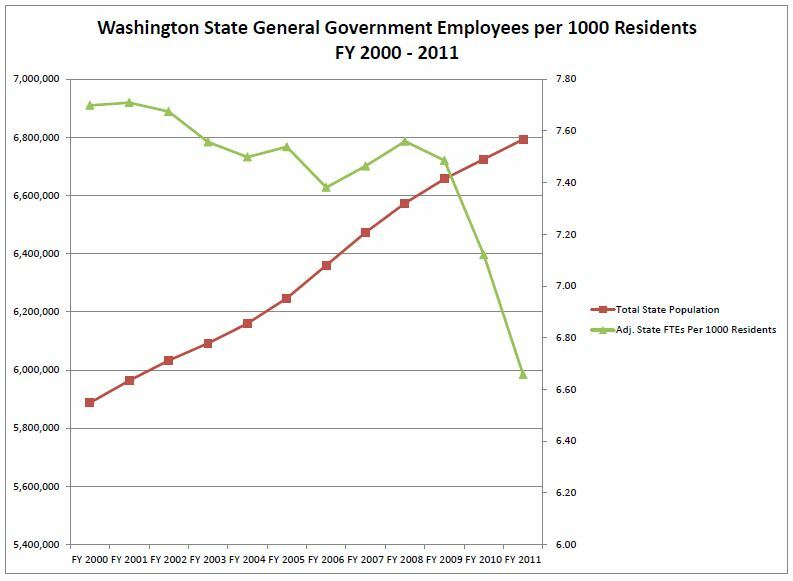 The chart above compares these employees with the growth in population in Washington. The end result is a 13.5% drop in general government state employees per thousand residents. Total employees, not adjusting for population is a 7.3% decline – not as dramatic as the number adjusted for population growth, but still not what most people have been expecting. Comparing compensation is a little more complex. If you compare state workers to the average of all private sector employees you get one set of results, and if you compare them to Microsoft engineers you get something different. Weighting deferred compensation (like pensions) against higher current salaries is also difficult. The devil is in the details of the comparison, and you can wind up doing “advocacy economics” if you aren’t careful. It’s easy to draw conclusions based on individual data points, or to do simplistic analyses of broad numbers. In general, this turns out to not work so well for making thoughtful comparisons. Of course, how you present the data (and how loudly) can serve to reinforce a point you are trying to make. We’ll be pretty careful in what we do, and the state employee base will most certainly be affected by the budget decisions we make, but we want to be sure to not create a situation where our salaries are non-competitive. Just like any private business, we rely on a quality workforce to be able to actually get things done, and having the compensation package too low means that all the people with other options in the world go somewhere else, leaving us with those that do not. Not a pretty outcome.